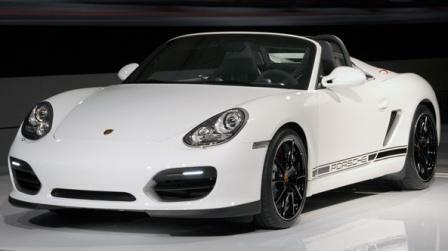 The well-known leading maker of highly efficient and desirable sports cars, Porsche has introduced its new 2011 Boxster Spyder at the Los Angeles Auto Show, which the company claims as its most nimble and sportiest mid-engine cars ever, featuring a 7-speed dual-clutch PDK (Porsche-Doppelkupplung) transmission, and 3.4-liter 6-cylinder engine with Direct Fuel Injection upfront of the rear axle to deliver 320 horsepower (10 more than Porsche Boxster S) maximum output. According to the company, Porsche Boxster Spyder that equipped with the Sports Chrono Package can accelerate from 0-60 mph in just 4.6 seconds, performing top speed of 166 mph with the top down. 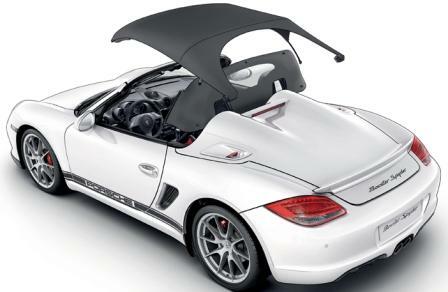 The new stylish, cool 2011 Porsche Boxster Spyder sport car that weights just 2,811 pounds is expected to be available by February 2010 for a base price of $61,200. This entry was posted on Friday, December 4th, 2009 at 11:05 am	and is filed under Interesting Stuff. You can leave a response, or trackback from your own site.